A brand new, standalone spin-off from The Billionaire's Obsession series, and the first novella in the Left At The Altar series!!! You met Lia and Zeke in Billionaire Unloved, Jett and Ruby's book. Now you can find out what happened to them. Did Lia really marry the wrong guy? I thought I had my life all worked out. My wedding had been meticulously planned. All I had to do was walk down the aisle and get married to the man I'd been engaged to for over a year. As usual, my best friend Zeke Conner is there to pick up the pieces when I get jilted by a jerk. He helps me work through the demoralizing event so I can put it behind me and move on. But when he offers to marry me himself, I'm stunned. But it's a bargain I can't really refuse. As my relationship changes with my best friend, I find myself caught in a web of sensual desire and unending passion that's as terrifying as it is satisfying. Probably because it seems all too real. But our arrangement was supposed to be temporary. A deal between friends so that we'd both benefit. What will happen when it all ends? Temporary Groom is a short and sweet novella, featuring Lia Harper and Zeke Conner, best friends for a lot of years. Zeke has always been Lia's protector, her friend through thick and thin, her hero. Lia has always had Zeke's back, been there for him anytime he needed her and would walk through fire to see him happy. These two can finish each other's thoughts, predict what they will do under certain circumstances and love each other through anything. When something happens that threatens to tear their friendship apart, Lia and Zeke realize that somewhere along the way their feelings have changed, has blossomed into something more, but is it possible to move forward and not lose the friendship that they value so much? Although this is a novella, the author gives you enough background information that you do not feel cheated out of details, but at the same time left me wanting more. I certainly hope that Lia and Zeke will make appearances in some of her other books so that we will know what is going on with them now. Five "just let it happen" stars for this one!! I really loved this book. It's a nice quick read that is a wonderful friends to lovers story. Lia and Zeke have been best friends for a long time and while they both have feeling for the other, neither has wanted to act on them fearing it will ruin their close friendship. When Lia finds herself a bride literally left at the altar, Zeke is the one who comes through for her. Then when she realizes her inheritance is in jeopardy unless she gets married, who else would she call for help other than Zeke. Can Zeke be happy just being her temporary groom? This is a wonderfully written book with amazing characters making it a must read! I highly recommend it. I love all of J.S Scott's books, and this one was no different. It was such a great, short, loving story. I love the friendship Zeke and Lia, friends since high school and when he offers a way to get her inheritance by marrying her, she takes him up on his offer. A great read!!! When you think about best friends you don't think about a guy and a girl, but in this case Lia and Zeke are trully best friends and they know each other that words are sometimes unnecessary. Since the first time Zeke saw Lia he has had an unexplicable attraction to her, a need to protect her and keep her from harm. That attraction has evolved into great passion and love. On Lia's 21st birthday she decides to let Zeke know how she feels, but a misundestaning will cause them to stay apart, looking for love in other people. Lia is not the defenseless girl he once saved, but the woman that is about to make the worse mistake of her life, marry the wrong man. When Zeke realizes that he can't witness Lia saying I do to anyone else, but him, he decides to stop this wedding only to find that the wedding has been canceled already. Fate is workig in his favor and without realizing it both are going to get what they always have wanted, more than they know. A bad thing can truly lead to something great and wonderful. Been left at the altar is the best thing that could ever happen to Lia. 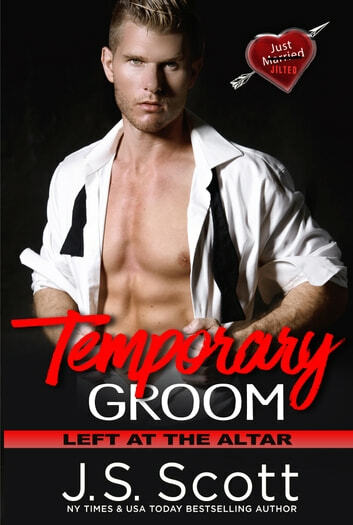 Temporary groom is a funny, romantic, passionate, page turner story that will leave you wanting more of Lia and Zeke.